The water buffalo or domestic Asian water buffalo (Bubalus bubalis) is a large bovid found on the Indian subcontinent to Vietnam and Peninsular Malaysia, in Sri Lanka, in the Philippines, and in Borneo. 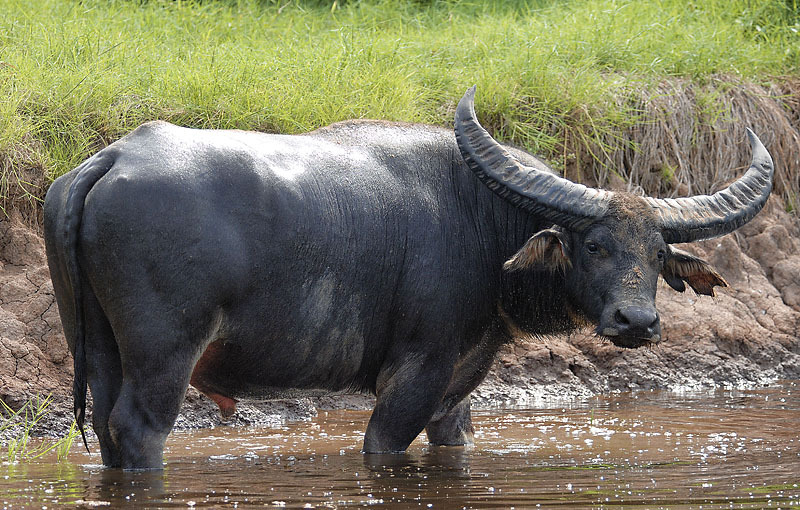 The wild water buffalo (Bubalus arnee) native to Southeast Asia is considered a different species but most likely represents the ancestor of the domestic water buffalo. Two extant types of water buffalo are recognized based on morphological and behavioural criteria – the river buffalo of the Indian subcontinent and further west to the Balkans, Egypt and Italy, and the swamp buffalo, found from Assam in the west through Southeast Asia to the Yangtze valley of China in the east. The origins of the domestic water buffalo types are debated, although results of a phylogenetic study indicate that the swamp type may have originated in China and domesticated about 4,000 years ago, while the river type may have originated from India and was domesticated about 5,000 years ago. Water buffaloes are especially suitable for tilling rice fields, and their milk is richer in fat and protein than that of the dairy cow. The large feralpopulation of northern Australia became established in the late 19th century, and there are smaller feral herds in New Guinea, Tunisia and northeastern Argentina. There are at least 130 million domestic water buffalo, and more human beings depend on them than on any other domestic animal.